Walter’s father, Thomas, was employed at the Royal Mint in Sydney for over 47 years and had been suffering ill health and died rather suddenly in 1905. At this time Walter was attending Marist Brothers High School at St. Mary’s Cathedral. When Walter completed high school he gained a cadet-ship as a draughtsman with the Department of Public Works. He completed his cadet-ship and qualified as an Engineering Surveyor before enlisting in the 1st Field Company Engineers on the 8th September 1914. Walter landed at Gallipoli with fellow originals from NSW on the 25th April 1915. He remained until June when suffering a chest infection he was transferred to the 1st Aust. General Hospital. Walter returned to Anzac but was transferred to the 4th Field Co. Engineers and remained on duty until the evacuation on the 18th December 1915. 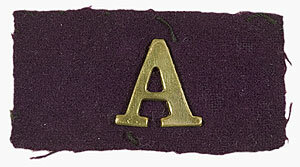 While Walter was returning to Egypt from Gallipoli in December 1915 with the 4th FCE, his sister Norah Gilchrist, a qualified nursing sister at St. Vincent’s and Garrison Hospitals Sydney was preparing to embark for London, as she was taking up duties in the Royal Hospital as part of Queen Alexandra’s Imperial Military Nursing Service (QAIMNS). Norah would spend three and half years looking after our Australian men at war and return home to face very different family circumstances. Above is an informal group portrait of eight Australian officers having breakfast in a shell hole in Sausage Valley in the forward area near Pozieres, France, taken in August 1916. They are using wooden food crates for a table, but they have crockery and a teapot. Identified is Captain Walter Richard Gilchrist MC, enjoying a cup of tea , he is seated 2nd on the right foreground with a cup of tea in his hand. In the same year, his initiative and devotion to duty on the 20th of October was to be recognised with him being awarded the Military Cross. Captain Walter Gilchrist was now an officer in the 6th Field Coy. Engineers and known to be a popular officer among his men. Several witness accounts on this day state that he was in command of the 1st, 2nd and 3rd sections of the company at Noreuil. It was recorded that on the morning of the 3rd of May he volunteered to lead an infantry battalion across to the Hindenburg Line, Bullecourt, as all the battalion’s officers had been killed or wounded. 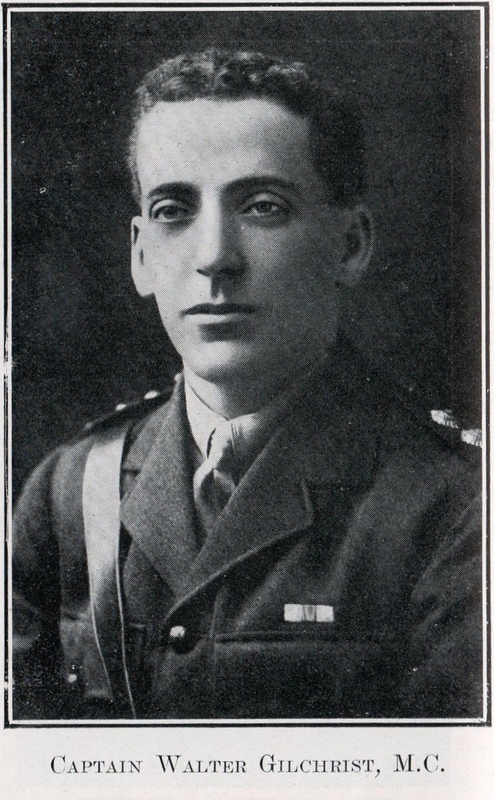 Lieutenant Colonel, Edmund J. H Nicholson – CMG, DSO, VD, like the original sappers was among the first men to enlist, he participated in the landing at Gallipoli, remained there until the evacuation, and then went to France, up to the time of the signing of the armistice. He was ultimately commandant of the Royal Engineers, Australian Corps Troops. More tributes to Walter and his bravery followed………..
“Captain Walter Gilchrist, M.C., was killed in France, when most daringly rallying the men for a renewed attack on the German line. The men had been foiled, the officers killed; still Captain Gilchrist rallied them, and led the charge. The daring act cost him his life; but news from the front shows that his courage and daring were the talk of all that knew him. His brother, Sergeant Bert Gilchrist, is at the front somewhere in France”…. Catholic Press – Thursday 1 November 1917. Tragedy struck the Gilchrist family again when Walter’s brother Albert was also killed on the 1st of September 1918. Albert lies in a marked War grave at the New British Cemetery at Assevillers, France. Walter Richard Gilchrist was reported to have been buried in an isolated grave 200 yards South South-East of Pozieres but by end of the War the exact location of his grave was lost. As a result, his name is recorded on the National Memorial to the Missing at Villers-Bretonneux in France. 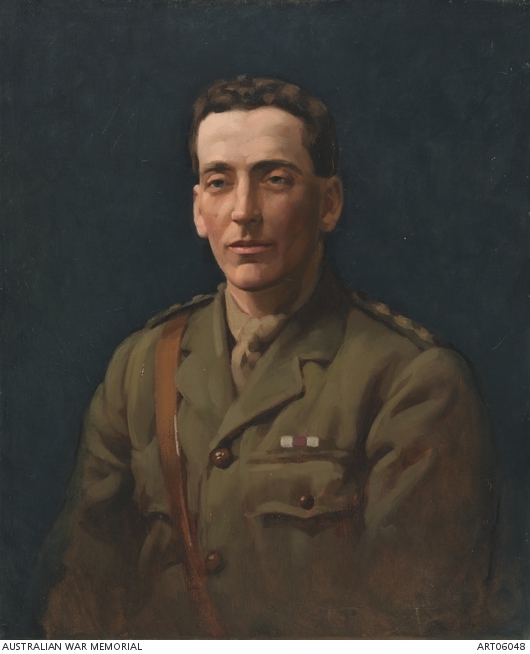 A fine posthumous portrait of Walter Gilchrist in oils by Florence Rodway is preserved at the Australian War Memorial in Canberra.